Dr. Vergil Brown, M.D. Ph.D.
Philip Jessen, APRN, is a registered nurse practitioner at the White-Wilson Internal Medicine Clinic in Fort Walton Beach. 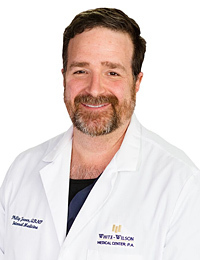 Before becoming a nurse practitioner, Mr. Jessen was a registered nurse and worked inpatient at Fort Walton Beach Medical Center for years before joining the White-Wilson Immediate Care team. During his time as a registered nurse he completed his Master of Science in Nursing from Troy University in Troy, Alabama. Today, he works with the Internal Medicine team in Fort Walton Beach to provide care that deals specifically with the assessment, diagnosis, treatment, and prevention of adult diseases. Patients love Mr. Jessen for his compassionate care and sense of humor!